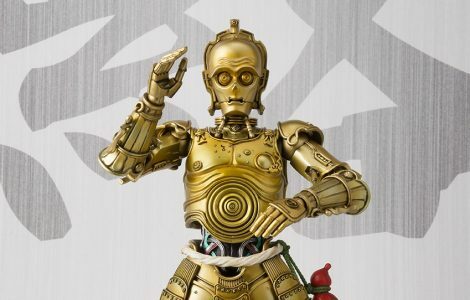 The Samurai themed Movie Realization action figue line by Tamashii Nations will get an interpretation of C-3PO. The figure will be released in January 2019, price is 9.504 Yen (about 85 USD). The figure does have articulated eyes and jaw. Check out some photos on the official Tamashii Nations website, the info is in Japanese, but Google Translate is your tool of choice here. You can also check out some more photos of the figure! Pre-orders will most certainly open soon. What do you think? Do you like Samurai C-3PO and is he something you will add to your collection? ← S.H. Figuarts Jar Jar Binks! Han Solo in carbonite block, Boba Fett, Emperor’s Royal Guards: they’re ALL coming in the S.H. Figuarts line. Dang. Other licensees should be trembling in their shoes now. ← S.H. Figuarts Emperor Palpatine In Throne Chair + More! Thank the Maker! S.H. Figuarts wins the “bravery award” for tackling Ewoks in 6″ scale. Check out this scrumptious Wicket with log accessory. I need 25 of these. Keep the OT in focus, S.H. Figuarts. The other stuff is incidental. Also included here is the Jabba The Hutt S.H. Figuarts figure. It looks fun! ← S.H. Figuarts Reveals A Ton Of New Figures! Multiple Chinese social networks are leaking images of incredible new Star Wars figures from S.H. Figuarts. Check out the gorgeous Luke Skywalker versus Darth Vader and Emperor in Throne Room chair. This is too much to take! S.H. Figuarts has revealed a TON of new figures in their impressive line of hig-end collectibles. See a full gallery of only SOME of what was revealed today on our Facebook page!! 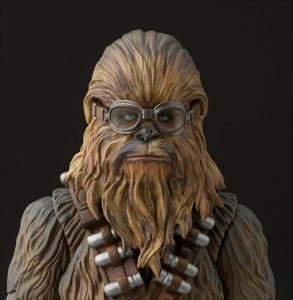 SH Figuarts Chewbacca And Mimban Stormtrooper Revealed! SH Figuarts has revealed its first two new figures for the upcoming Solo: A Star Wars Story: Chewbacca and the Mimban Stormtrooper! Click through for more photos and details! 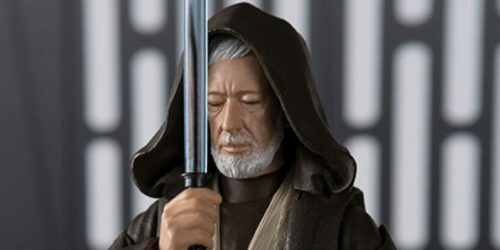 S.H.Figuarts revealed via their blog the upcoming Ben Kenobi (A New Hope) 6″ figure. Stop by shfiguarts.com for the full gallery. The listed release date is June 2018.